Currently, Bangladesh is passing through the transitional phase of industrialization. Despite all recent challenges, Bangladesh surprisingly has made fair enough positive strides in improving working conditions and protecting workers rights. The recent improvements in the readymade garments are highly appreciated by the international agencies and representatives of various nations. The present Government of Bangladesh has taken a number of firm efforts which have already yielded some significant changes in the apparel sector. In recent times the country has achieved never experienced before progresses in many labour standard indicators. Under the new labor law, the definition of labor has been amended. Being an inclusive labor law, now, it has brought the most unfamiliar labor sectors including ship breaking, ship building, security service, mobile phone companies, shrimp vessels and shrimp processing etc. 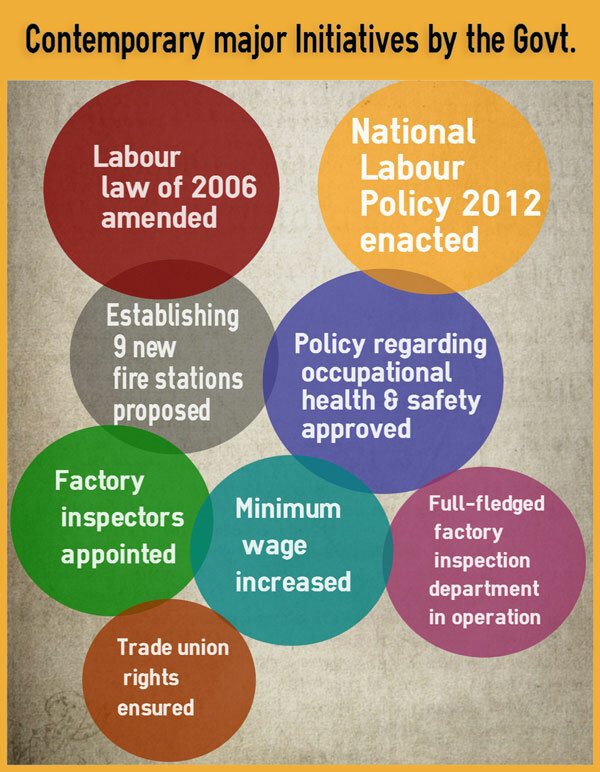 In order to make the law time-befitting, a total of 87 sections of the 2006 labour law have been amended. According to the amendments, workers would no longer need approval from factory owners to form trade unions. The new law also allows trade unions to be formed in the different administrative wings of a factory. Labour standard in Bangladesh is been upgraded in recent years. In 2011, the then government of Bangladesh approved 6 months of maternal leave for the female workers who have been permanently working in the organization for at least 6 months. Low wage of the garment workers was a burning issue in Bangladesh as the workers and employees couldn’t come to an agreement. To avoid conflicts and stalemate situations, Prime Minister Sheikh Hasina came forward and raised the minimum wage of workers by 77% from 1600 tk (20 $) to 5300 tk (66 $). The new law stipulates that 5% of annual profit has to be deposited in provident and welfare funds. It also has the provision of paying compensation for the workers in case of their death, termination from services and accidental deaths during duty hours. The new law would gradually force the factory owners to ensure safety of the workers by providing all personal protection equipments. They will have to ensure secured power system, ensure that the exit paths are unlocked and the staircases/paths in the factories are kept open during the working hours to meet any emergency. A new provision for keeping consistency between the structural design of the building and factory lay-out has also been included in the amendment. It will be mandatory for every factory to keep its workers abreast of work risk(s) with a view to securing occupation health and safety of the workers. Government is collaborating with ILO to formulate an inspection policy for the factories and establishments. This policy is designed to ensure effective and prevention-oriented labour inspection and occupational safety. All the industries in the country will be brought under a comprehensive inspection system. The Department of Inspection of Factories and Establishments (DIFE) is the designated agency to implement the policy. Inspectors are being recruited on contract basis for the time being. A tripartite Natinal Plan of Action on fire safety in the RMG sector collaboratively signed by the representatives of workers, owners and the Ministry of Labour & Employment with the support of ILO. To ensure the occupational health and safety for every factory labours in Bangladesh, the Awami League government has finalized a draft of a policy on this issue. Collecting the accurate data on occupational hazards, number of sick and affected workers, treated workers, rehabilitation of an injured worker, ensuring security of the female workers, specialized institute for occupational disease diagnosis and treatment, labour court at labour dense areas are the main features of the draft. To secure the life of the labors at work, bringing them under life insurance is a common practice in the developed world. Following this trend, Bangladesh is planning to provide life insurance for the RMG workers in the first phase. Significantly, informal labour has also been brought under life insurance coverage. In 2013, government collaborated with Worker’s Welfare Foundation Board to ensure safety for the construction workers in the country. Government would provide 2500 $ if any worker loses their ability to work by accident or dies at work. Most of the developing countries do not provide residential facilities for the labours. But Bangladesh is trying to follow this widely-practiced trend. At Ashulia (an outskirt of Dhaka city), Department of Women affairs under Ministry of Women and Children affairs has acquired 0.97 acres of land to build a hostel for the garment workers. This project will be started from 2017. In Chittagong (the second important city of the country), government collaborating with Chittagong Development Authority (CDA) is planning to provide lodging facilities to 1000 female garment workers along with a market, a hospital, open grounds and gardens. The recent inclinations towards change have definitely started a new era in Bangladesh in terms of ensuring labour rights. According to national and international community the new labour law was a major advancement in establishing workers’ rights, and if it is properly implemented it would bring more stability as well as prosperity in the industrial sector. In last couple of years Bangladesh has transformed itself from being a laggard to upward-performer in respect of labour standard. A number of international institutions like ILO, EU, WB, TIB and so many expressed deep satisfaction over the recent changes in labour standards in Bangladesh. The US ambassador to Bangladesh Dan Mozena, recognizing the radical changes taken place in Bangladesh, remarks that Bangladesh now is on track to achieve a strong, dynamic, profitable garment industry, one where workers are fairly compensated, and have a voice in their working conditions to ensure their safety and security.